Rene Russo has made a career of starring opposite some of Hollywood's most powerful men. Kevin Coster (Tin Cup), Clint Eastwood (In The Line of Fire), John Travolta and Danny Devito (Get Shorty) and Robert De Niro (the upcoming Rocky and Bullwinkle) are just a few. 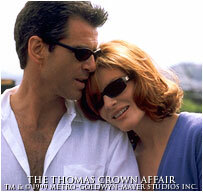 This time out, in The Thomas Crown Affair, she can arguably eclipse her male co-star, Pierce Brosnan (The World is Not Enough, Mrs. Doubtfire). This is a new version of the 1968 film starring Steve McQueen and Faye Dunaway, the latter of who makes an appearance in the new film. This is also the second time this summer where a film plot involves a thief and a woman who is after him and who may or may not also be a thief. The first time was in Entrapment with Sean Connery and Catherine Zeta-Jones, and it wasn't that good. This remake isn't much better. 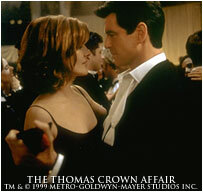 Thomas Crown (Brosnan) is your typical Bruce Wayne type rich boy. He owns a large, multi-million dollar company, and seems to have nothing to do but idle around. He collects fine pieces of art, and by golly, he is an art thief. Crown organizes a heist as a cover for him to steal a Monet that he tried to obtain through legitimate means a while ago. Katherine Banning (Russo) works for an insurance firm, and is sent in to help the police department recover the painting. Working with Banning is Detective Michael McCann (Denis Leary, True Crime, Wag the Dog) and Detective Paretti (Frankie Faison, The Rich Man's Wife, Mother Night). McCann and Paretti want to recover the painting through legitimate means, while Banning prefers a more personal approach. She directly tells Crown that she is after him, and they begin a torrid romance, where each one is trying to keep one step ahead of the other. Banning never knows whether Crown is playing a game with her or falling in love with her. There is nothing really remarkable about this film. Leslie Dixon and Kurt Wimmer's script moves along tepidly, providing Russo and Leary with horrible lines that are supposed to come off as funny. The story limps along, with Crown and Banning continually trying to get under the covers and under each other's skin. The ending sequence helps to salvage the movie, but director John McTiernan (Die Hard, The 13th Warrior) plays it out until it gets boring. Brosnan plays a suave man with lots of gadgets. Call him Bond...I mean Crown. Thomas Crown. Leary seems to have taken a step back in his acting career, moving away from his more recent roles and towards The Ref. Dunaway's role is curious, especially in light of the ending. Russo does well, but her role doesn't call for much more than wearing lots of expensive clothes, and then taking them off. The only interesting aspect of the movie revolves around art forgery. Art reproduction house Troubetzkoy Paintings, Ltd. was commissioned to replicate the paintings used in the film. Works by Monet, Picasso, Degas, and many others fill the museum and Crown's personal apartment. They look wonderful, but we don't really get a chance to see them up close. 2 hours, 5 minutes, Rated R for some sexuality and language.